If you’re complying with the OSHA Silica Standard for Construction by following the requirements in Table 1, then congratulations! You’re doing well. But do you know about the two little hidden gems in the standard? Those two requirements are connected to the use of respirators in Table 1. For those tasks that require a respirator, OSHA only says “APF 10”. You probably know that APF 10 means that the worker is to use either a filtering face-piece (dust mask), or a re-usable cartridge-equipped half-mask respirator. But do you know that being required to use a respirator during that task also means that your organization must write and implement a Respiratory Protection Program (RPP)? And that means all the bells and whistles such as respirator selection, medical clearance (OSHA Questionnaire), fit testing (initial and annual), and training. The second little gem is a bit more technical. Because the Silica standard is focused on protecting workers from ‘Respirable Dust’ (very fine particles), then the respirator used must be capable of protecting against those extremely small dust particles. That’s no problem if your workers are using a re-usable ½ mask respirator with filter cartridges since those filter cartridges are HEPA filters, which protect against 99.97% of particles down to 0.3 microns. Very effective. But if you choose to use a dust mask, then you have to be careful. 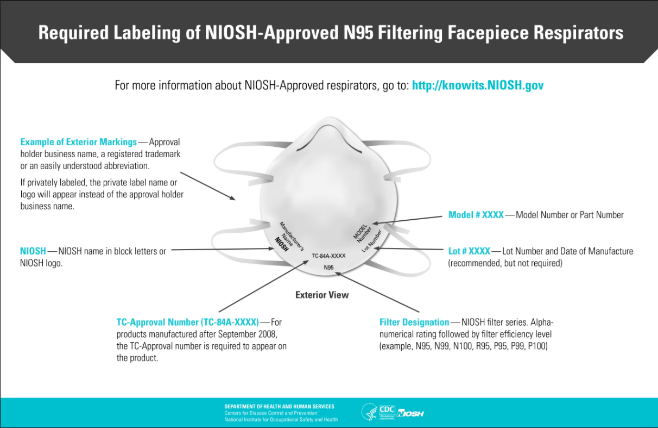 The most commonly used dust mask is the N-95. The ‘95’ means that the mask is only 95% effective against those small particles. So, you need a better dust mask. One that is equivalent to the HEPA filter. No problem. Just ask your supplier to provide you with a N-100 dust mask and you’re good to go! And with regard to that letter ‘N’ in N-95: Sometimes dust masks are used to protect workers from exposure to oil mist. Dust masks that offer protection against oil mists have a ‘R’ (Oil Resistant) or a ‘P’ (Oil Proof) designation. Masks designated with ‘N’ are the least expensive (and most common) since they are NOT treated to provide protection against oil mists. N-100 dust masks are made by Moldex, 3M, and other manufacturers. 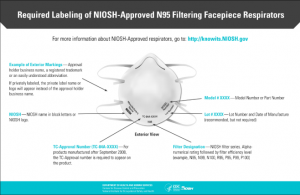 But wherever you buy your dust masks, be sure that they are always NIOSH approved. Beware cheap un-approved knock-offs!